A squirt of agave is a sweeter taste is desired. A high-powered blender, such as a Vita-Mix is going to work the best with this recipe. Add the squash slowly to the water, then add the rest of the ingredients and blend until smooth. I like to blend it to the point where it’s a little warm, but not “cooked”. Top with your favorite things! 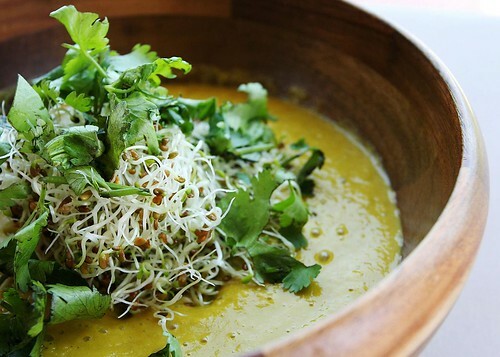 Texture is KEY when you are making super smooth raw soups. In order to avoid “baby food syndrome”, I love to add some CRUNCH to it! this sounds wonderful…I have a bunch of celery leftover and I was just wondering what I could make with it. I just need to pick up some basil, green onion and squash, but it was getting to be shopping time anyway! Sounds great. Must try it. Sara, do you have a dehydrator? What type? If not how do you make your flax crackers? Hi! This is not a comment directly about this soup, although it does look yummy! I am a reader of your blogs and have enjoyed the recipes you have posted here. I am a vegetarian of years and have raised my 3 children veg as well. The challenge of this lifestyle is that we live in Bolivia. It is not common here to be vegetarian much less vegan or raw. We came vegan but have had to compromise a few things to live here and be respectful toward the culture. I was born here in bolivia to a bolivian mother and an american father. My husband is canadian (where we met and married) and we moved to Bolivia 3 1/2 years ago, as we wanted to raise our family in a developing country. We are missionaries/volunteers. My husband, Tyson, directs a foundation that runs a girls orphanage, work on the street with street girls and kids and we are about to open the first daycare orpahange in Bolivia for kids with HIV/AIDS. (if you are interested you can see our work website: http://www.ninosconvalor.org ). Anyways, all this to say that i recently ordered a vita mix and used your affiliate number. i am sorry to say that because it was a 220volt model you won’t get ‘credit’ but we do save on shipping…. thank you! this was a help in purchasing such an expensive machine! I am the nutritionist for our foundation and strive to bring healthier eating habits to those we work with. 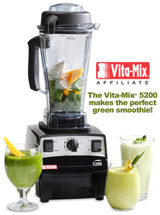 i believe also that the vitamix will be a great tool for the kids with HIV that we will be working with. I believe that nutrition is such a powerful tool and will be able to be used greatly with these kids! BTW: i am also a dready mama! I’ve been dying to get a Vita Mix, & this post definitely won’t help my pocketbook 🙂 Now I want to buy one even more! I made this tonight with pumpkin, and it was great!! Thanks! So Good! I love your idea about adding the Avo and sprouts. Arugula would be yummy, too. My bowl didn’t last long enough get those ingredients into it. Good call on the Tahini it made for nice creamy texture and compliment to butternut. Mahalo! Have extra game print outs in case your guests want more of these games. In the present time, Delhi encapsulates two very different worlds, the ‘old’ and the ‘new’.